With respect to the FIFA World Cup taking place in South Africa this month, I thought I would share a taste of product design, something I spotted at this year's ICFF in NY, something that is set to revolutionize the way that shoes are bought and sold around the world. For the last 3 years Puma has been working with the company, fuseproject, to rethink and redesign the shoe box as we know it. Their goal was not only to cut down on material in the manufacturing process, but also to subsequently save in fuel and electricity during the distribution and retail processes. And on top of all of that it is easy to recycle the product from the home. 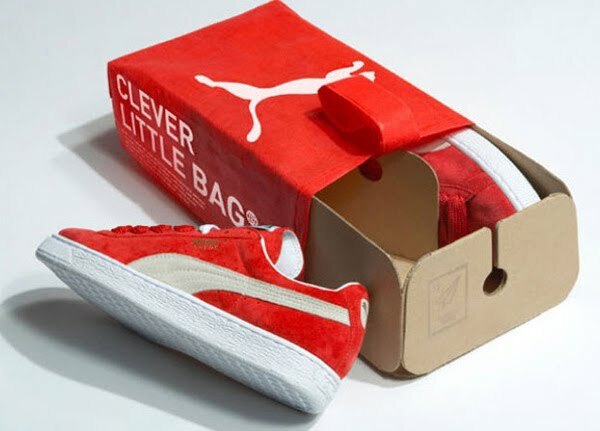 What they eventually came up with ditched the concept of a box almost completely and instead focused on the bag, resulting in the "clever little bag". 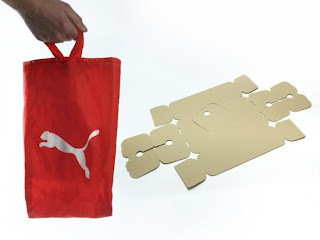 The cardboard support structure is die cut from a single flat piece of material with no additional printing or assembly required, this makes the recycling process easier and faster. The bag takes less material and energy to make and is completely recyclable. All in all, this 'clever little bag' cuts energy and material usage in manufacturing alone by at least 60%. That's more than a step in the right direction, that's a giant leap towards bettering the world through everyday design.